Rail commuters from the Medway towns saw 30 minutes knocked off their journey times into London as the Strood and Higham tunnels reopened on Monday. The two-mile tunnels were closed last January for £35m repairs after a series of chalk falls. A replacement bus added 30 minutes to the journey. "The Strood and Higham tunnels have been problematic for generations," said Network Rail route director Dave Ward. "This solution will serve the people in Kent for 100 years." The Strood tunnel, hand cut through chalk, was opened in 1824. In 1999, falling chalk derailed four train carriages and 56 passengers had to be rescued. Further falls followed and a 20mph speed limit was introduced until the tunnel had to be closed completely. The walls have now been relined, new drainage installed and track replaced and trains are able to run at 70mph again. Passengers using services through the tunnel on Monday morning said the past year had been bad and the reopened tunnel would make a lot of difference. 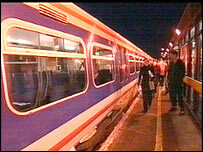 Michael Holden, managing director of South EasternTrains, said the big challenge now was improving timekeeping. "We have improved during the last year but not as much as I would like, especially in our Metro area," he said.